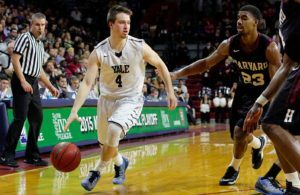 Yale, sporting the best overall record among the Ivy League teams, got its first taste of conference play this season, and hung on to defeat Brown, 70-67, before a near capacity crowd at the small Pizzitola Center in Providence, R.I. Things weren’t decided until Desmond Cambridge of Brown barely missed a three-point attempt from the baseline as time expired and which could have sent the game into overtime. Cambridge was held to just seven points on only 3-of-19 from the field, including 1-of-9 from three-point range, finishing more than 10 below his average. While Yale was concentrating on stopping Cambridge, Tamenang Choh scored 18 points and grabbed 16 rebounds to lead all players. The Bulldogs have now won seven in a row and nine of their last 10, while Brown’s six-game winning streak came to an end. 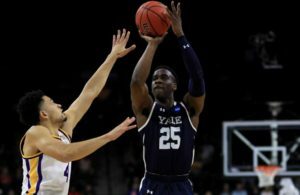 Yale’s Alex Copeland scored 14 points, and three others were in double figures. As a team Yale shot 47.5 percent from the field and Brown 38.4. After six ties and eight lead changes, Yale pulled out to a 67-59 advantage on Jordan Bruner’s layup and 2:07 remaining. But the home team fought back and got to within one, 68-67, following Obi Okolie’s three-pointer with 15 seconds left. When Miye Oni followed with a dunk Brown had two chances to force overtime but Zach Hunsaker and Cambridge each missed from behind the arc. While Matt Morgan of Cornell moved into fourth place among Ivy League career scorers, his team saw Columbia make up an 18-point deficit and go ahead by one before the Big Red edged the Lions 60-59. Morgan, a senior guard, finished with 18 points, 2,044 in his Ivy career, and is now fourth on the all-time conference list. The game started at 1:30 p.m. on Saturday instead of 4 o’clock because of predictions of a snow storm that had already started in Ithaca, NY. With 3.8 seconds left, and Cornell ahead 60-58, Gabe Stefanini of Columbia made the first of two foul shots, but missed the second. A rebound attempt by the Lions also failed as time ran out. Cornell scored the first 14 points of the game and was on top 39-25 at halftime, during which Morgan made 19 of his 21 points. Columbia, on three straight baskets by Stefannini finally took the lead, 58-57 with 2:31 left. 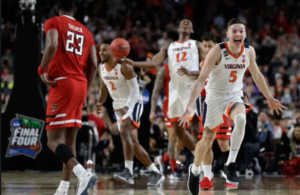 Jimmy Boeheim, son of the Syracuse coach, then made a 3-pointer to put Cornell back in front 60-58 with just over two minutes remaining. Morgan and Boeheim both missed the front ends of 1-and 1 opportunities before Stefanini was fouled. With this game the staggered start of the Ivy League season has now been completed and all eight teams have played at least one game. Princeton (2-0) leads, while Yale, Dartmouth and Cornell are at 1-0. Meanwhile, Brown, Columbia, and Harvard have all lost their only contest and Penn (0-2) is in last place. The Quakers defeated city rival Temple, 77-70, in out-of-conference play on Friday.